Brisbane South PHN’s geographic boundary is directly aligned with that of the Metro South Health local hospital network. This enables the efficient transfer of valuable knowledge and skills between organisations. Click here to access the Department of Health’s interactive map to match a postcode with its PHN. Large proportion of vulnerable populations: CALD, refugees, older persons and Aboriginal and Torres Strait Islander peoples. 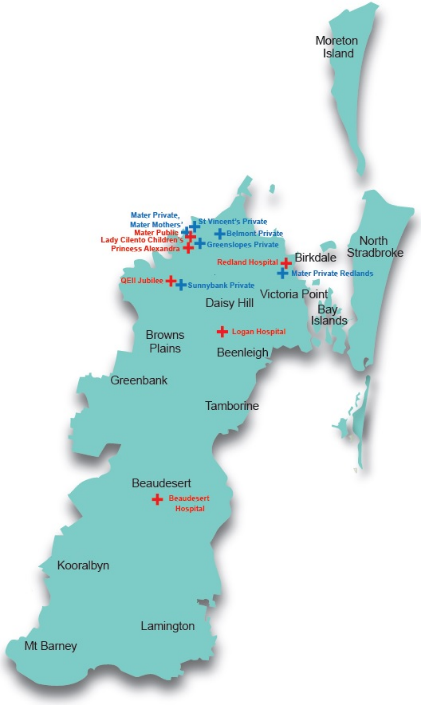 Seven public hospitals: Beaudesert Hospital, Logan Hospital, Princess Alexandra Hospital, Queensland Children’s Hospital, QEII Jubilee Hospital, Redland Hospital and Mater Public Hospital. 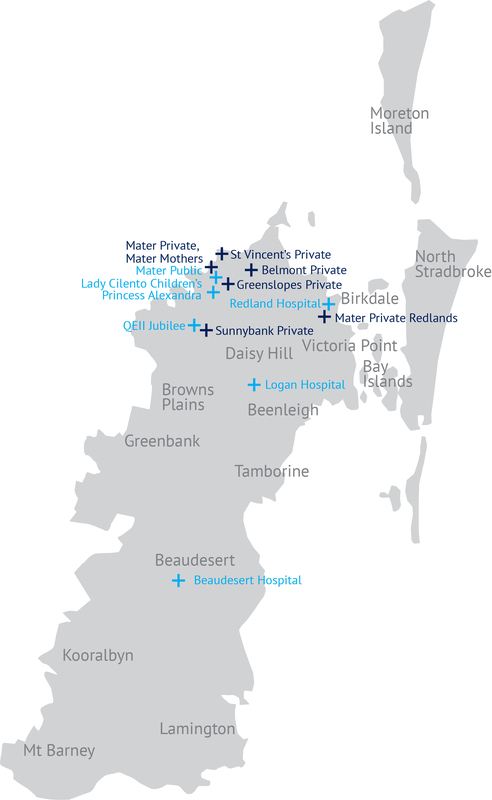 Six private hospitals: Greenslopes Private Hospital, Mater Private, Mater Mothers’ Private Brisbane, Mater Mothers’ Private Redland, St Vincent’s Private Hospital and Sunnybank Private Hospital. Eight community health centres: Beenleigh CHC, Browns Plains CHC, Corinda CHC, Eight Mile Plains CHC, Inala CHC, Logan Central CHC, Marie Rose Centre, Redland Health Service Centre, Logan Central CMHC, Southern Queensland Centre of Excellence – Inala, Woolloongabba CHC and Wynnum-Manly CHC. Four local government authorities: Brisbane City, Logan City, Redland City and Scenic Rim Regional.